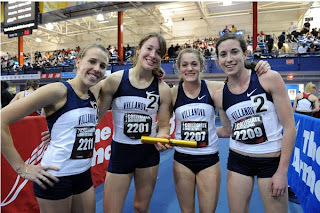 In a thrilling DMR at the New Balance Collegiate Invitational on February 5 at the Armory, the Villanova women defeated the defending DMR national champions from Tennessee and 2009 5th place finisher Georgetown, all of whom finished within one second of each other. Sheila Reid ran the 1600 meter anchor and out-leaned Tennessee's defending NCAA 800 meter champion Phoebe Wright for the win. Villanova's time of 11:02.83 is the #2 time in the NCAA this season (behind only Oregon) and an NCAA automatic qualifier. The Tennessee women are accustomed to championship racing at the Collegiate Invitational, especially in the distance medley relay, where they first set the American record last year. This time, the Lady Vols were again in the lead in the closing stages with NCAA 800 champ, Phoebe Wright holding the baton on the mile anchor leg. But for lap after lap she towed the field and Villanova’s Sheila Reid took advantage and pounced in the last 50 meters. Wright nearly held her off but Reid won on a lean and Villanova claimed victory in 11:02.83. Tennessee finished in 11:02.85.